Cat exercise equipment doesn't have to be elaborate. Indoor-only cats lead longer, healthier lives, but tend to sleep more and become fatter than their outdoor-roaming counterparts. Obese cats are at risk for diabetes, heart conditions, arthritis and a shortened life. Exercise will help keep Fluffy fit and trim, so encourage activity with feline-friendly exercise equipment. Get Fluffy off the couch and burning calories in a vigorous play session for several minutes each day. 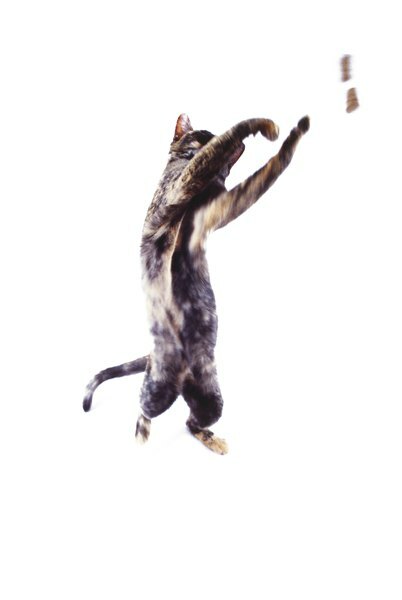 Simple cat toys are very effective for cat exercise. Most cats find it hard to resist the elusive red dot of a laser light; leading to plenty of running, leaping and pouncing. Many cats enjoy chasing a piece of yarn or a bunch of feathers, so lead Fluffy in several laps around the house. A plastic milk jug lid and a tile or vinyl floor is all it takes to start a vigorous game of cat hockey. A crumpled paper bag or ball of aluminum foil gets most cats off the couch and happily playing. Cats instinctively climb to high places where they can safely observe their domain. Work that instinct to your advantage by providing plenty of climbing opportunities for your cat to to burn calories and improve his physical condition. Multi-level cat trees attract most cats, especially if positioned near a window for outdoor gazing. Some are quite elaborate, with ramps, hammocks, multiple towers and enclosed spaces. Hang feathers, rope or bell toys from the perches to keep Fluffy amused and active. If you have more than one cat, a larger cat tree with multiple levels will help prevent fighting over a perching spot. Few cats can resist the allure of a tunnel. Perfect for hiding and pouncing, a tunnel gives your cat a good workout, then provides an excellent spot for a well-deserved nap. Most pet stores have collapsible cat tunnels made of lightweight, strong fabric that crinkles enticingly with Fluffy’s every step. If your cat doesn't get the idea immediately, toss a few treats into the tunnel to lead her inside. For even more fun, dangle a feather toy outside the tunnel entrance, or shine a laser light toy into the tunnel to give Fluffy a thrill. It's not for every cat or every home, but a cat exercise wheel is one way to get Fluffy up and running. Most cat wheels are heavy plastic or metal with a sturdy base and look like an oversize hamster wheel. Some cats, particularly active breeds like Bengals, get the idea almost immediately, but many cats need some encouragement to run on their wheel. Don't put an unsure cat on the wheel and spin it right away, or you'll frighten her. Let her investigate the wheel, and offer her a treat when she climbs aboard. Shining a laser light toy onto the track inspires many cats to start chasing the elusive light; others begin jogging if you hold a treat in front of them. Be patient, and give Fluffy lots of praise whenever she gets on the wheel. With time, treats and encouragement, most cats learn to use a wheel and enjoy an excellent workout. Newport Harbor Animal Hospital: How Can My Cat Get More Exercise to Lose Weight? What Are the Dangers of Having Two Cats & Only One Is an Outside Cat?